Ruthie's DIY tip of the day. I found this photo about a year ago and wanted to blog about it. I mainly wanted to comment on the way they enhanced this space by adding one square block of paint to the wall. This is a great idea if you live in a small space or are renting and can't paint the whole room. By adding this dark chocolate square on the wall, they've added an amazing backdrop as well as interest for their artwork to be showcased. It has also added height to this room. Sometimes our furniture looks off scale in a room that doesn't have a nice bold color on the wall. This couch and the chairs are now alive and well in this room. Everything is well balanced and there is now a focal point in this space. 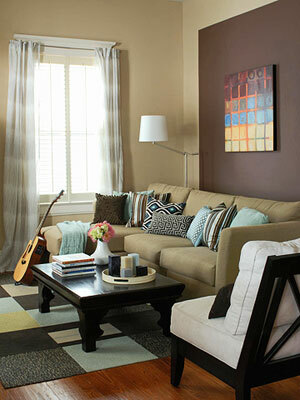 This living space is very eclectic with the variety of fabrics. Even though they are all different, the patterns go well with the rug. Definitely not "matchy, matchy." Also look collected over time which is what it should look like! Love the way the white lampshade compliments the white chair. Small detail but it makes this space look finished. One thing I don't like is that the draperies are hung too low and should have been hung above the molding. This kind of paint technique would be wonderful as a backdrop to a bed as well. What I love about this "do it yourself tip of the day" is that it can be done in a few hours! Who says you have to paint the whole room?